The Java platform's garbage collection mechanism greatly increases developer productivity, but a poorly implemented garbage collector can over-consume application resources. In this third article in the JVM performance optimization series, Eva Andreasson offers Java beginners an overview of the Java platform's memory model and GC mechanism. She then explains why fragmentation (and not GC) is the major "gotcha!" of Java application performance, and why generational garbage collection and compaction are currently the leading (though not most innovative) approaches to managing heap fragmentation in Java applications. Garbage collection (GC) is the process that aims to free up occupied memory that is no longer referenced by any reachable Java object, and is an essential part of the Java virtual machine's (JVM's) dynamic memory management system. In a typical garbage collection cycle all objects that are still referenced, and thus reachable, are kept. The space occupied by previously referenced objects is freed and reclaimed to enable new object allocation. In order to understand garbage collection and the various GC approaches and algorithms, you must first know a few things about the Java platform's memory model. When you specify the startup option -Xmx on the command line of your Java application (for instance: java -Xmx:2g MyApp) memory is assigned to a Java process. This memory is referred to as the Java heap (or just heap). This is the dedicated memory address space where all objects created by your Java program (or sometimes the JVM) will be allocated. As your Java program keeps running and allocating new objects, the Java heap (meaning that address space) will fill up. Eventually, the Java heap will be full, which means that an allocating thread is unable to find a large-enough consecutive section of free memory for the object it wants to allocate. At that point, the JVM determines that a garbage collection needs to happen and it notifies the garbage collector. A garbage collection can also be triggered when a Java program calls System.gc(). Using System.gc() does not guarantee a garbage collection. Before any garbage collection can start, a GC mechanism will first determine whether it is safe to start it. It is safe to start a garbage collection when all of the application's active threads are at a safe point to allow for it, e.g. simply explained it would be bad to start garbage collecting in the middle of an ongoing object allocation, or in the middle of executing a sequence of optimized CPU instructions (see my previous article on compilers), as you might lose context and thereby mess up end results. To quickly free unreferenced memory in order to satisfy an application's allocation rate so that it doesn't run out of memory. To reclaim memory while minimally impacting the performance (e.g., latency and throughput) of a running application. In the first article in this series I touched on the two main approaches to garbage collection, which are reference counting and tracing collectors. This time I'll drill down further into each approach then introduce some of the algorithms used to implement tracing collectors in production environments. Reference counting collectors keep track of how many references are pointing to each Java object. Once the count for an object becomes zero, the memory can be immediately reclaimed. This immediate access to reclaimed memory is the major advantage of the reference-counting approach to garbage collection. There is very little overhead when it comes to holding on to un-referenced memory. Keeping all reference counts up to date can be quite costly, however. The main difficulty with reference counting collectors is keeping the reference counts accurate. Another well-known challenge is the complexity associated with handling circular structures. If two objects reference each other and no live object refers to them, their memory will never be released. Both objects will forever remain with a non-zero count. Reclaiming memory associated with circular structures requires major analysis, which brings costly overhead to the algorithm, and hence to the application. Tracing collectors are based on the assumption that all live objects can be found by iteratively tracing all references and subsequent references from an initial set of known to be live objects. The initial set of live objects (called root objects or just roots for short) are located by analyzing the registers, global fields, and stack frames at the moment when a garbage collection is triggered. After an initial live set has been identified, the tracing collector follows references from these objects and queues them up to be marked as live and subsequently have their references traced. Marking all found referenced objects live means that the known live set increases over time. This process continues until all referenced (and hence all live) objects are found and marked. Once the tracing collector has found all live objects, it will reclaim the remaining memory. Tracing collectors differ from reference-counting collectors in that they can handle circular structures. The catch with most tracing collectors is the marking phase, which entails a wait before being able to reclaim non-referenced memory. Tracing collectors are most commonly used for memory management in dynamic languages; they are by far the most common for the Java language and have been commercially proven in production environments for many years. I'll focus on tracing collectors for the remainder of this article, starting with some of the algorithms that implement this approach to garbage collection. Copying and mark-and-sweep garbage collection are not new, but they're still the two most common algorithms that implement tracing garbage collection today. Traditional copying collectors use a from-space and a to-space -- that is, two separately defined address spaces of the heap. At the point of garbage collection, the live objects within the area defined as from-space are copied into the next available space within the area defined as to-space. When all the live objects within the from-space are moved out, the entire from-space can be reclaimed. When allocation begins again it starts from the first free location in the to-space. 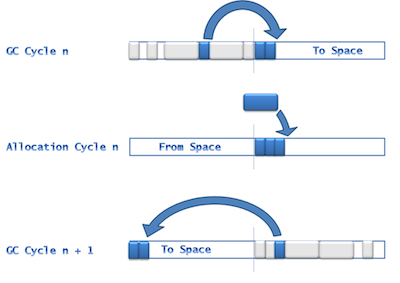 In older implementations of this algorithm the from-space and to-space switch places, meaning that when the to-space is full, garbage collection is triggered again and the to-space becomes the from-space, as shown in Figure 1. More modern implementations of the copying algorithm allow for arbitrary address spaces within the heap to be assigned as to-space and from-space. In these cases they do not necessarily have to switch location with each other; rather, each becomes another address space within the heap. One advantage of copying collectors is that objects are allocated together tightly in the to-space, completely eliminating fragmentation. Fragmentation is a common issue that other garbage collection algorithms struggle with; something I'll discuss later in this article. Copying collectors are usually stop-the-world collectors, meaning that no application work can be executed for as long as the garbage collection is in cycle. In a stop-the-world implementation, the larger the area you need to copy, the higher the impact on your application performance will be. This is a disadvantage for applications that are sensitive to response time. With a copying collector you also need to consider the worst-case scenario, when everything is live in the from-space. You always have to leave enough headroom for live objects to be moved, which means the to-space must be large enough to host everything in the from-space. The copying algorithm is slightly memory inefficient due to this constraint. Most commercial JVMs deployed in enterprise production environments run mark-and-sweep (or marking) collectors, which do not have the performance impact that copying collectors do. Some of the most famous marking collectors are CMS, G1, GenPar, and DeterministicGC (see Resources). A mark-and-sweep collector traces references and marks each found object with a "live" bit. Usually a set bit corresponds to an address or in some cases a set of addresses on the heap. The live bit can, for instance, be stored as a bit in the object header, a bit vector, or a bit map. After everything has been marked live, the sweep phase will kick in. If a collector has a sweep phase it basically includes some mechanism for traversing the heap again (not just the live set but the entire heap length) to locate all the non-marked chunks of consecutive memory address spaces. Unmarked memory is free and reclaimable. The collector then links together these unmarked chunks into organized free lists. There can be various free lists in a garbage collector -- usually organized by chunk sizes. Some JVMs (such as JRockit Real Time) implement collectors with heuristics that dynamically size-range lists based on application profiling data and object-size statistics. When the sweep phase is complete allocation will begin again. New allocation areas are allocated from the free lists and memory chunks could be matched to object sizes, object size averages per thread ID, or the application-tuned TLAB sizes. Fitting free space more closely to the size of what your application is trying to allocate optimizes memory and could help reduce fragmentation. TLAB and TLA (Thread Local Allocation Buffer or Thread Local Area) partitioning are discussed in JVM performance optimization, Part 1. The mark phase is dependent on the amount of live data on your heap, while the sweep phase is dependent on the heap size. Since you have to wait until both the mark and sweep phases are complete to reclaim memory, this algorithm causes pause-time challenges for larger heaps and larger live data sets. One way that you can help heavily memory-consuming applications is to use GC-tuning options that accommodate various application scenarios and needs. Tuning can, in many cases, help at least postpone either of these phases from becoming a risk to your application or service-level agreements (SLAs). (An SLA specifies that the application will meet certain application response times -- i.e., latency.) Tuning for every load change and application modification is a repetitive task, however, as the tuning is only valid for a specific workload and allocation rate. There are at least two commercially available and proven approaches for implementing mark-and-sweep collection. One is the parallel approach and the other is the concurrent (or mostly concurrent) approach. Parallel collection means that resources assigned to the process are used in parallel for the purpose of garbage collection. Most commercially implemented parallel collectors are monolithic stop-the-world collectors -- all application threads are stopped until the entire garbage collection cycle is complete. Stopping all threads allows all resources to be efficiently used in parallel to finish the garbage collection through the mark and sweep phases. This leads to a very high level of efficiency, usually resulting in high scores on throughput benchmarks such as SPECjbb. If throughput is essential for your application, the parallel approach is an excellent choice.